Cats aren’t known for sharing, but this handmade ceramic duo lives to serve savory flavor at your table. Put these feline friends on the dining table without fear: the little cuties won't knock things off it or beg for human food. The duo's mission is to help you enjoy yours by serving the salt and pepper. Their excellent behavior proves these aren't real kitties—though each has its own personality, plus ridiculously cute paws. 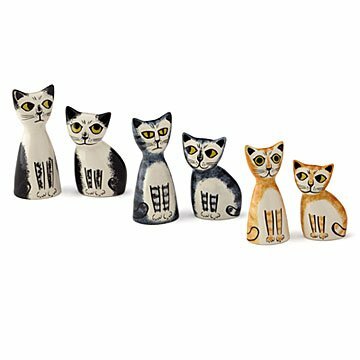 Treat a cat person to the ceramic pair, and the housemates won't freak out about the latest "adoption." Catisfaction guaranteed! Choose ginger, gray tabby, or black and white. Set of two. Handmade in Sri Lanka.